The series of frames here shows the deplorable and severe aftermath of tropical storm Ketsana, local name Ondoy, which caused flooding to a vast area in the capital region and neighboring provinces due to the unabated torrential rain and wind. An mga minasunod na retrato nagpapaheling kan kaherak-herak na dulot kan bagyong Ketsana, lokal na apod Ondoy, na nagdara nin pagbaha sa kadakulaan kan Kamanilaan asin kataid na provincia huli sa daing untok na makusog na uran asin doros. The typhoon entered the eastern side of the big island of Luzon and made landfall between the provinces of Aurora and Quezon, even as rain started pouring earlier on Friday evening in metro Manila and the howling wind Saturday morning, September 26th in the general direction of the northern part of the country..
An bagyo naglaog sa tahaw kan Aurora saka Quezon, maski and uran nagpoon magbulos kan Viernes na banggi sa Kamanilaan asin an duros kan bagyo Sabado nin aga man namatian, Septiembre 26 pasiring sa norteng parte kan nacion. Nearby three Bicol provinces of Camarines Sur, Camarines Norte and the island-province of Catanduanes were earlier pronounced within the typhoon path under signal number 1, of wind gustiness from 30-60 km per hour. The typhoon packed a wind gust of 165 kilometers per hour (105 ml/hr) near its center. An kataraid na tolong provincia kan Camarines Sur, Camarines Norte asin an islang provincia kan Catanduanes enot na pinatanidan kan sinyal numero uno na may doros na 30-60 kilometro por hora. An bagyo may darang kusog na duros na abot sa 165 kilometro por hora harani sa centro. Worst hit by the typhoon are the provinces of Pampanga, Bulacan, Rizal, Cavite, Laguna, Quezon and Batangas. 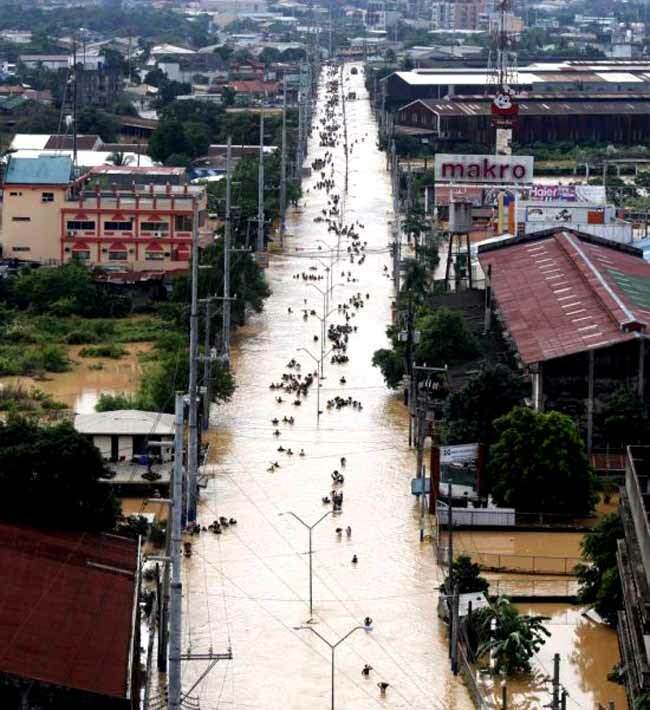 Eighty per cent of metro Manila was submerged in flood waters. Other surrounding provinces also sustained agriculture and infrastructure damages. More than a hundred perished and over half million residents were displaced. An sobrang tinamaan kan bagyo iyo an Pampanga, Bulacan, Rizal, Cavite, Laguna, Quezon kaiba man an Batangas. Otsenta por ciento kan Kamanilaan napairarom sa baha. An iba pang nakapalibot na provincia nagmati man nin perwisyo sa agrikultura saka infrastraktura. Sobra sa sanggatos katao an nagadan saka sobra sa kabangang milyon an nawaran nin estaran. 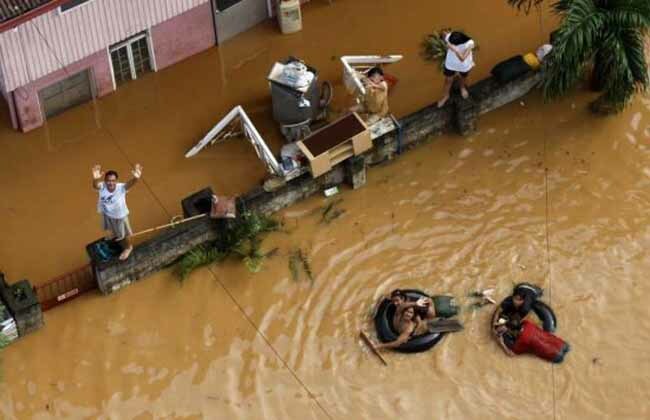 A total of 27 provinces were affected in the main island of Luzon including the two in the island of Mindoro. May total na 27 provincia an afektado sa isla kan Luzon kaibahan an duwa sa isla kan Mindoro. We worried a lot all thru the night and until the next. We have many close relatives in metro Manila. To mention a few, my Mother’s (1) sister and her hubby, near Sta. Lucia, Pasig,(2) sister-in-law and her four children and their respective families, (3) two nieces, one in Pasig and another in Cavite, (both sisters of our team member-cousin Marching7) and their families. Also kept us anxious all the night and until the next day were (4) my sister’s two daughters living in Sta. Mesa district of Manila, one has just passed the medical licensure board and another studying medicine, and (5) my sister-in-law and her family in Antipolo city. Nagparahadit kami sa enterong banggi saka kinaagahan. Pano may mga partidaryo kami na yaon sa Kamanilaan. Si Mama kaya (1) an tugang na babae saka agom yaon sa Sta. Lucia,Pasig, (2) agom kang tugang niyang lalaki saka apat na aki kaini pati pamilya man, (3) duwang pamangkin na babae, saro sa Pasig asin sa Cavite (pareho tugang kan kaiba mi digde Marching7), pati mga pamilya ninda. (4) duwang aking babae kan tugang ko sa distrito kan Sta. Mesa, an saro nakapasar pa sana sa pagka-doktor, an huri nag-aaadal pa man nin medicina., asin (5) ang tugang kan agom ko asin saiyang pamilya sa Antipolo. 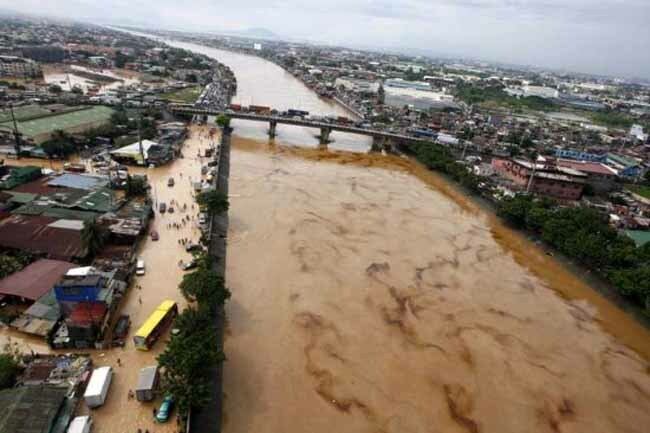 Due to the storm, bunker oil from a paper manufacturing company spilled about 100,000 liters in Marikina river and mixed with the floodwater. Crudo hale sa sarong kumpanya na naggigibo nin papel aksidenting nag-ula nin 100,000 litro sa salog kan Marikina na napahalo pa sa baha. And yet, the weather bureau has announced early Monday morning that another low pressure area has been sighted over the Pacific ocean which could develop into a typhoon and hit the Phillippines later this week. As of this posting, the low pressure has been named now a tropical storm, international code name Parma, or local Pepeng. Ngonian, nagpatanid an PAGASA aga nin Lunes na igua na naman nin bagong nagpopoon na bagyo sa tahaw nin dagat Pacifico. Bago ko iposte ini, pinangaran na nin internasyonal na koda Parma, mientras na Pepeng naman sa local na apod. This is my contribution for the Memes of My World and Watery Wednesday. I won’t elaborate on the events as the information is now all over the internet, You Tube and various social networking sites. I’m posting these to generate more interest and concern in behalf of our countrymen who are in deep need. The photos are not mine, but courtesy of our friends at the Philippine Air Force. Currently, there are various government and non-government agencies involved raising funds and goods to alleviate and help those ravaged by the typhoon. This is my post for This is My World. Many thanks to Klaus, Sandy, Wren, Fishing Guy and Louise for hosting this wonderful meme: My World – Tuesday. This entry was posted in NEWS, WEATHER STORIES and tagged natural calamity. Bookmark the permalink. Gosh that is awful, I cant think of words to say! Japa: That is a true shame, floods are part of life that are better to not see. You captured the aftermath wonderfully. i can’t even imagine the massive relief effort just to get people out and meds to them and so on. not a good thing. How terrible ! We all feel that the situation is highly dangerous and we hope that the rest of the world can soon help you. We sincerely hope that you will be spared another catastrophy.Are your relatives safe now? My thoughts are with you! I’ve sent the link to these photos to other people I know; many have not heard about the floods. As of today, massive rescue operations still on-going since there are still villages submerged in floods. Ordinary citizens not affected are helping. The Philippine National Red Cross, radio, TV, newspaper and private organizations have launched campaigns and are now raising funds, food, bottled water, packed noodles, bread, medical supplies, clothes, etc. Now being distributed on areas on the affected population. Bloggers based near or about the metro Manila area are also doing their share. Social networking tools like Twitter and Facebook are utilized to give updates and directions, too. 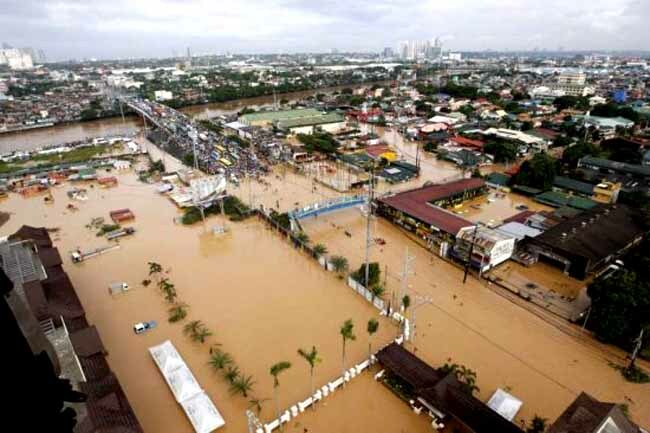 Have confirmed Monday afternoon our relatives in the metro are safe but suffered the same fate as the general population, specially those I mentioned in Pasig, their houses were soaked in mudwaters. I really hope the rest of the world can help you soon. I’ll do my best to send your link to other people I know that may not have heard about the floods. Take care and do your best to stay safe! I too am for a loss of words, the devastion is just awful! how awful!! theese pictures reminds us to be happy with all our fortune! That’s catastrophic. I’ve seen the photos in the newspaper. We had a dust storm last week but that was nothing in comparison to this terrible devastation. It’s too massive a destruction. They are saying the worst flooding the country has seen in 40 years. I have not seen anything that bad while living in PI. My heart goes to everyone. we watched on TV how bad the flood is. I hope the international aid bodies will help. On Sat, I was talking to a filipino friend who found a street kids in her city. The flooding from the typhoon is unbelievable. I certainly hope this second storm misses the Philippines. We don’t hear about these floods in such detail so your blog is informing us all…I hope you are safe and that you will get the help needed. I hope the storms will go away. 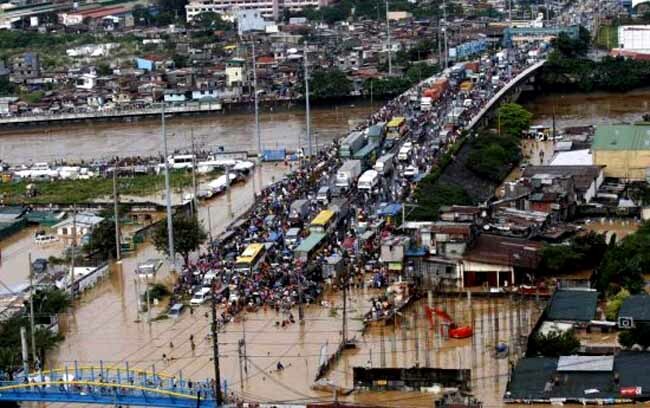 i wish the government would prioritize disaster preparedness to save lives and properties. Philippines is a laboratory of disasters yet we are always caught by surprise. am just praying that relief efforts can reach as many people as soon as they can.It’s just so sad know and more so, to see my countrymen suffering. Invece le ultime foto, sigh, sono molto drammatiche! Such terrible scenes and I’m so sorry for everyone affected. I hope the latest storm misses the Philippines. What a terrible terrible tragedy for your country. Thanks for posting. God bless you and your countrymen. The pictures are so gripping. I hope the relief efforts underway are helping the people. What a most dreadful disaster. I’ve seen some pictures on T.V. Thanks for taking the time to share with us. OMG, I’ve seen this on the news, but your pictures make the scale of the disaster very immediate and vivid. I hope you and all your family come safely through this. A tragic Watery Wednesday theme. I will look out for the chance to make a contribution to the aid effort. Unimaginable. I’ve gone cold just looking at these photos. I’ll follow so I can know what happens. Not much use that – except maybe it helps to know people around the world are bearing you all in mind. Not much use – but, for most of us, that is all one can offer. Lets hope Typhoon Lupit doesnt add more problems for these people.